We will pick you up early in the morning from your hotel in Cairo with private modern van and personal tour guide then drive about 3 hours to Alamein. Arrive there to explore the location of the WW II great battle took place in 1942, wander the WW II Museum & Cemetery. Proceed to the pretty bay of Marsa Matrouh on the coast of Mediterranean Sea then head to Siwa, about 6 hours driving then dinner and Overnight in Siwa. Pick up shortly after the breakfast Siwa hotel to explore Shali or Siwan Old City, wander the tombs lying inside Gabal El Maouta or " the Mountain of the Dead" like SI Amon, MSW Isis and the Crocodile Tomb. Transfer to enjoy the Bedouin style life and enjoy the Roman Spring eye in Abu Sherouf village. Experience the charming Sunset at Al Awsat lake then transfer back to your hotel. Dinner & overnight in Siwa. Breakfast in hotel then pay a visit to Cleopatra bath, the Alexander Temple at the village of Aghurmi which is devoted to the God Amon. Get your lunch then drive to the Siwa House Museum and admire another recommended Sunset scene at Fitness Lake. Overnight in Siwa. 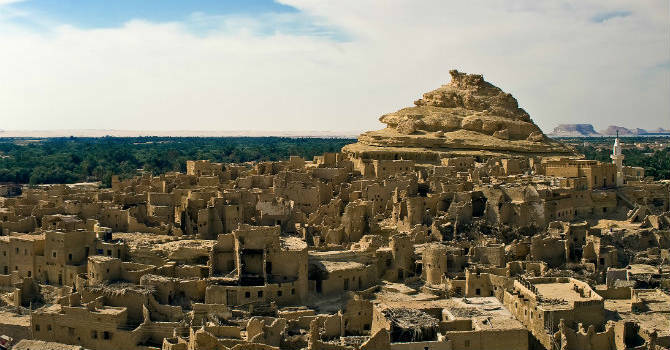 Uncover Siwa desert after breakfast in hotel, start at the village of Abu Ali then cross to the Great Siwa Mountain to check first human footprint over the mountain is dating back to the to prehistoric era. Continue to the fossils area to explore the rocky coral reef dates back to the Cambrian era then drive to the spring eyes of Shiata Lake. Enjoy the sand surfing in the desert before swimming in the cold spring relaxing atmosphere. Transfer to the hot spring for chill and tranquilize your Muscles and end the day admiring the Sunset with Bedouin Tea. Transfer back to your hotel in Siwa & Overnight. Check out after breakfast then drive back to your hotel in Cairo.